Gold has had an outstanding run for the past decade or so, but is gold still a good investment? By some measures, it has been the top performing investment during that time. But is that a trend that’s likely to continue. Or is gold near the end of a very long, very profitable bull market that’s likely to start heading the other way? Though it seems as if global financial concerns are settling down, there’s still enough uncertainty to fuel a continued rise in the price of gold. Central banks have exhausted the benefits of disinflation. Since at least 1980 central banks worldwide have been gradually putting downward pressure on inflation as a way of expanding the economy. But once you get down to near zero inflation, how much benefit will come from disinflation? And is there a risk of deflation? There are already signs that central bank sentiment is changing, and if it is, that could mean even higher gold prices in the future. Relatively few investors own gold. On the surface this may seem like a negative for gold, but the opposite may be closer to the truth. Since so few people invest in gold, the potential for continued price growth could be fed by a stampede into gold. 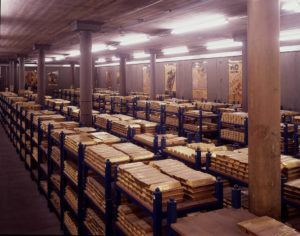 That could bring gold prices higher than anyone ever thought possible. Global finances remain impaired. The troubled debt overhang remains from the global financial meltdown that began in 2008. And since then, major governments around the world have increased debt in an effort to fight off economic troubles. The lingering economic troubles in Europe confirm this trend. Stocks and bonds are near all time highs. The fact that interest rates are at all time lows and stocks are near all time highs raises that possibility that a wholesale shift in the financial landscape isn’t too far away. If that does happen, gold could benefit in a major way. The US presidential election. As the largest economy in the world, so much rests on what happens in the US. The outcome of the presidential election can weigh heavily on the investment world and cause a shift in sentiment. Generally speaking, uncertainty seems to favor gold. There are an equal number of reasons why the price of gold may go the other way. Strategy change by central banks. Over the past few years, central banks have been net buyers of gold. That has had a significant impact on the stunning rise in the price of gold. If sentiment should change, and central banks go back to selling gold, the price trend will likely reverse. A return to stability. We’ve been experiencing instability in the world for so long now that it’s virtually priced into gold and other investments. But if things were to gradually stabilize, this would prove to be a negative for gold, especially over the long term. The global economy gets worse. We don’t normally like to think that this can happen, but if you’re thinking about investing in gold you really have to. If the global economy gets worse we could move from disinflation to deflation, and that would be an entirely different dynamic. Since gold typically functions as a currency alternative, and since deflation would make currency more valuable, gold could be one of the first casualties of the trend. A reversal in interest rates. Central bank policy toward disinflation has also lead to steadily lower interest rates. Low interest rates are bullish for gold because it lowers the value of fixed income investments as a store of value. Should interest rates begin to rise, gold prices could fall as investors show a greater preference for interest bearing investments. Gold pays no interest or dividends. This is the most well worn argument against gold as an investment. Since it pays no interest or dividends, the entire success of gold as an investment is a rising price. If that isn’t happening, investor sentiment could turn negative quickly. Which way do you thing the price of gold is heading? I would not overweight gold in a portfolio until we get a more definitive read on deflation. I believe there is a higher probability of deflation than most people believe. After all the money the Federal Reserve has pumped into the economy; it should be roaring and inflation accelerating. But neither is occurring. The money is not being circulated into the economy. It’s possible that the deflationary pressures are so great that they are overwhelming the government fiscal and monetary stimulus. I wouldn’t be the first time government has proven to be impotent!